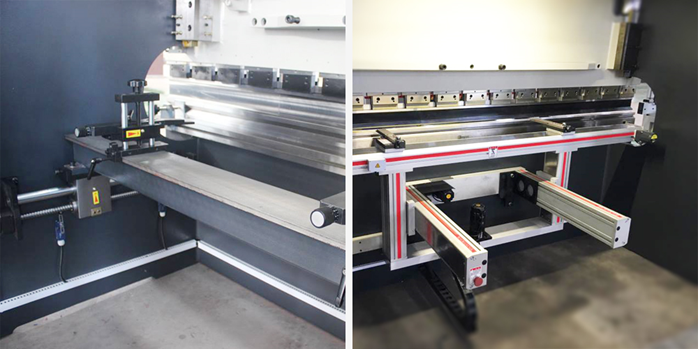 The frame of press brake is welded by the left and right upright plate, worktable, supporting bodies and fuel tanks. The worktable is under the left and right uprights. The fuel tank is welded with the uprights, which can improve the rigidity and strength of the frame, as well as increase the heat dissipation area of the hydraulic oil. Wedge-shaped crowning, to ensure a higher bending accuracy. The ram is made from the whole steel plate, and is connected with the piston rod in the center of the left and right oil cylinder. The cylinder is fixed on the connecting plate of the left and right wall plate, and the piston rod is driven by hydraulic drive to move the slider up and down. In order to ensure the accurate positioning of the ram in the upper dead point, a grating ruler is arranged on both sides of the ram to transfer the position information back to NC controller, and the position is adjusted by the controller. At the same time to ensure the synchronous operation of the ram. The ram adopt hydraulic transmission and the ram system consists of the slider, oil cylinder and mechanical stopper for fine adjustment. The left and right cylinders are fixed on the frame, and the piston (rod) is driven by the hydraulic pressure to move the ram up and down. The mechanical stopper is controlled by the numerical control system. 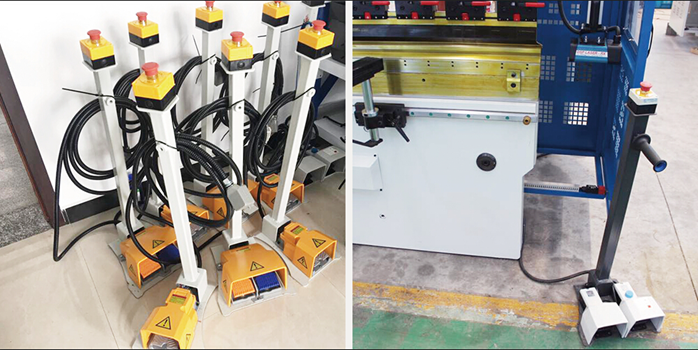 The forward and backward movement of the back stopper is driven by the motor, and the moving distance of back stopper is controlled by CNC controller, with minimum reading 0.01mm (there is stroke limit switch both at the front and back position). The mechanical synchronization mechanism consists of torsion, swing arm, joint bearings etc. It has a simple structure, stable and reliable performance, as well as high precision synchronization. 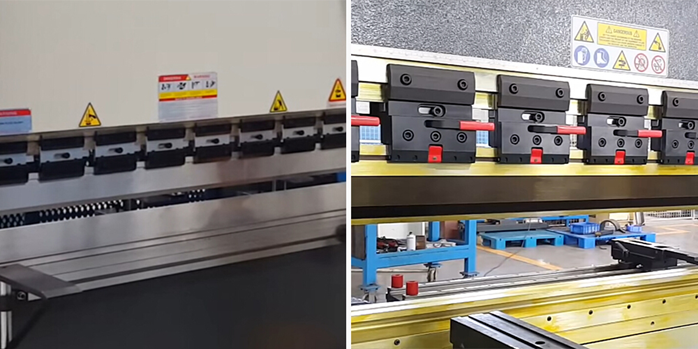 The position of the mechanical press brake stops is adjusted by the motor, while the data is controlled by CNC controller. The backgauge of the CNC press brake adopt motor driving transmission, to realize synchronous movement of two ball screw timing belt. The backgauge distance is controlled by the CNC controller. 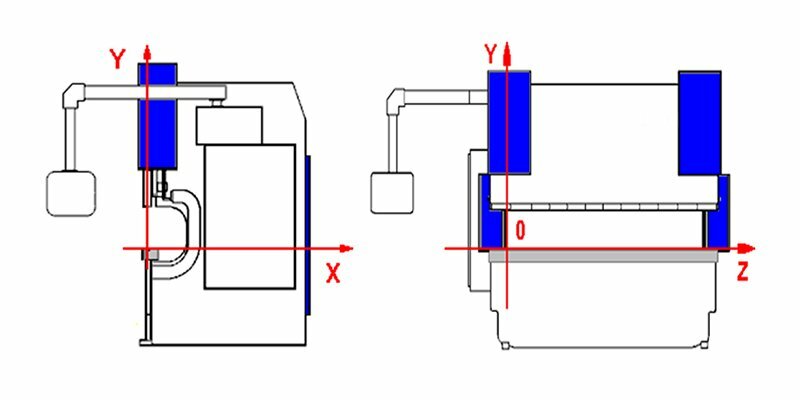 X, Y, Z directions of press brake are as follows, the arrow in the figure is positive. 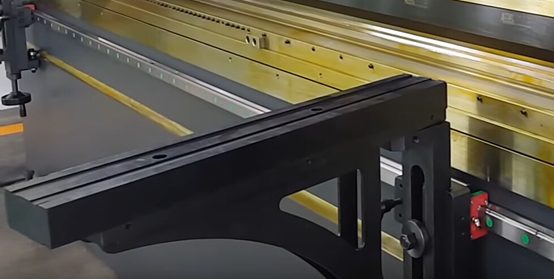 The front supporter arms of press brake are fixed on the T-groove or linear guide in front of the machine and are designed with a manually adjusted back position claw. The pedal switch of the press brake is mainly used to control the up and down of the top punch during bending operation. There is also one emergency button on top of the pedal switch for emergencies. Press Brake clamps including normal standard clamps and fast clamping tools for quick change of the top punch. Clearly, fast clamping tools will make it much easier for change punch die, not only convenient but also time-saving. 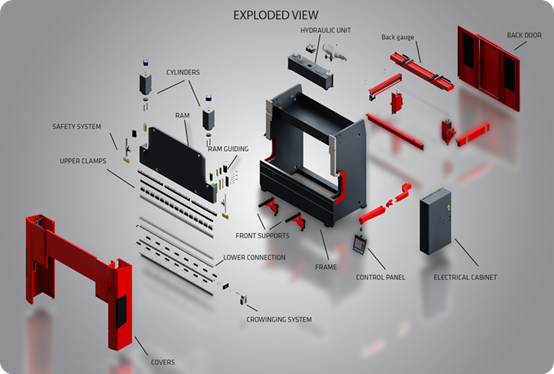 Generally, the press brake will be equipped with steel fence to protect the workers from injured. If you want to have better safety assurance, then you can consider to use light curtain safety device and laser protection device. As I know, the safety of the machine must reach a certain degree, otherwise, it’s forbidden to use it. So I suggest you to equip the press brake with at least light curtain device for safety consideration. CNC Bending Machine power supply using three-phase AC 50HZ 380V power, can not only be directly used for the main motor operation, but also for the rear gear servo and equipment lighting use after output AC voltage through the system internal transformer. 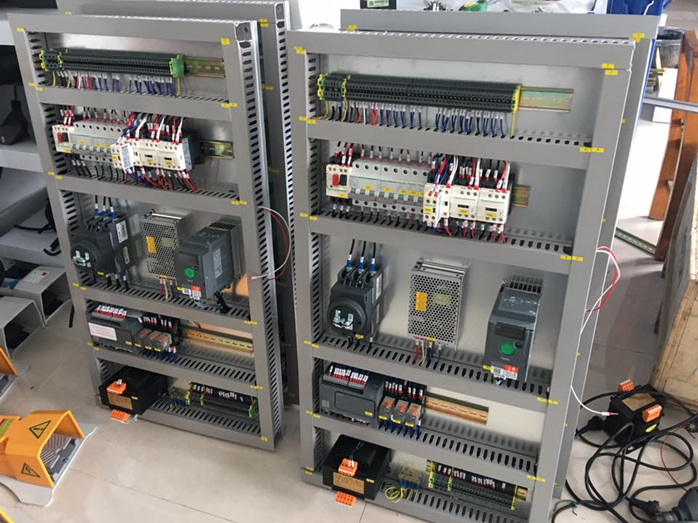 The other group form into two sets of DC 24V after rectification, one way for CNC controller use, the other for the use of controlling loop. The motor, oil pump, valve are connected with the fuel tank, in order to ensure that the oil tank is filled with oil when the ram is rapidly falling, the structure of filling valve is adopted, which will not only improve the travel speed of the ram but also save energy. 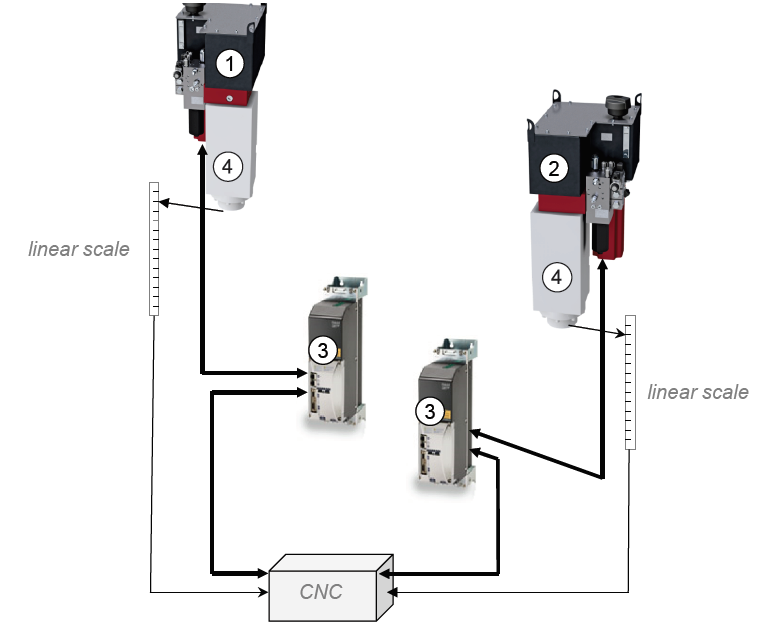 The hydraulic control of CNC press brakes requires a high degree of automation and standardization rate in the manufacturing. Therefore, the press brakes must integrate the hydraulic system into it. 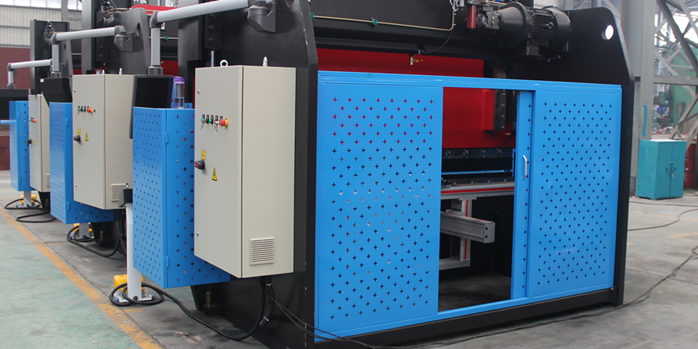 The frame of the press brake become the basis for the installation of hydraulic parts and integrate the oil tank into the stamping frame. It has three control blocks. 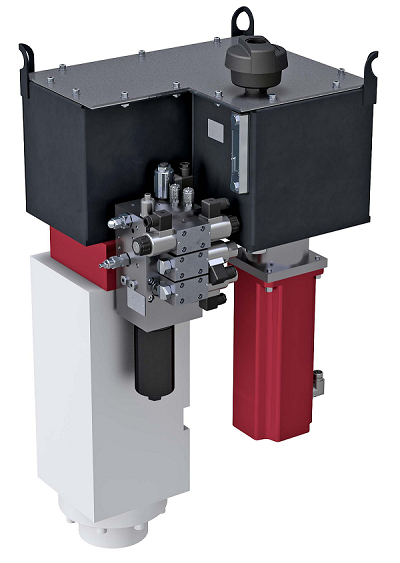 Two with the middle plate filling valve and the main control block directly installed in the hydraulic cylinder in order to achieve the pipe-free connection between the main control block and the hydraulic cylinder. The back pressure assembly consists of a reversing seat valve and two relief valves, corresponding to the customer’s requirement as a non-leaking type. 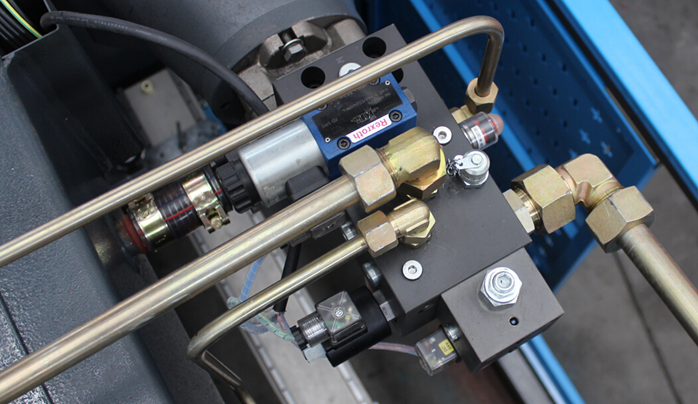 The main installation here is the proportional relief valve and a maximum pressure shut off valve, as well as monitor the reversal valve at the position of the pilot valve. The central control block combined three control blocks into one which is mainly used in some special structure due to control reasons. The control block and the connection between the two-hydraulic cylinder must in the symmetrical layout. It uses SFA series of oil filling valve. The valve is in flange structure, directly installed in the hydraulic cylinder, and connected to the tank by a suction pipe. 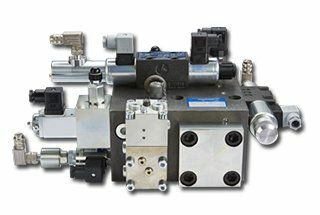 All the solenoid valves are concentrated in a control block. Similarly, the electrical connections of the valves are also concentrated on a single cable to achieve a common connection. For this purpose, an interface distributor is provided on the central control block. When replacing the hydraulic oil, you must discharge the cover of the oil tank. Use the towel to clean the bottom of the tank (do not use cotton yarn), then wash with cleaning coal oil gasoline. For the limitation of tank cover, the arm cannot reach the end of the tank; you can wrap the towel on the bamboo or stick to wipe each corner. Loosen the leaking plug or brake valve to leak out the dirty oil. Use the cleaning towel to dry the sides and bottom of the tank until it’s clean. If necessary, roll the dough at the welding seam or difficult cleaning places to cling the dirt, and then put on the cover. If the working pressure and temperature of the hydraulic system are higher, and the working speeds slower, the chose hydraulic oil mark is higher. It is recommended to use antiwar hydraulic oil ISO VG46# (the average value of viscosity is46mm2/s, when the temperature is 40℃.). If the machine operates under 5℃ for a long period, you can choose hydraulic oil ISO VG32#. Under the normal working conditions, the oil temperature must not exceed 70C. Under special conditions, oil cooler can be fitted necessary. The weight of press brake ranges from 5T to 300T, this is much depending on the size of the machine. For example, for 80T/2000mm press brake, the weight is around 6T, however, the weight for 2000Tx12000mm press brake is over 300T. 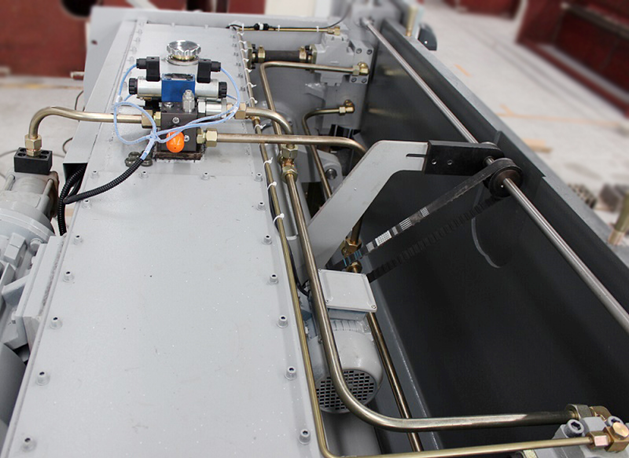 The press brake is pressurized by two working cylinders at both ends of the ram. The deformation force of the bending workpiece is in the middle, so the sliding block and the worktable are deformed together with the upper and lower die. 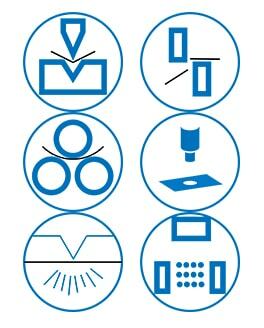 It causes the sheet material to be uneven along the length of the die edge, which directly affects the accuracy and straightness of the bending workpiece. Therefore, it is necessary to take corresponding measures to reduce or eliminate the deflection caused by the deformation. 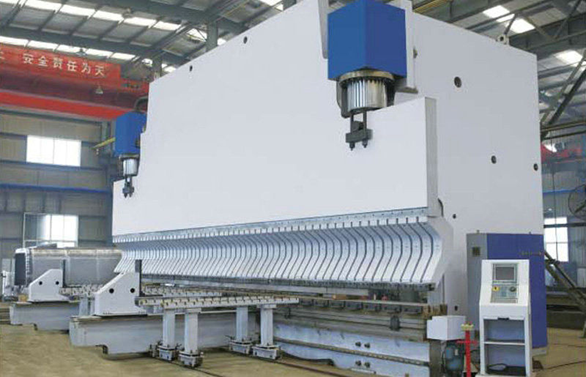 The so-called deflection compensation device has preset a deformation in the direction of the opposite force-deformation in the sliding block and the upper die or the worktable and the lower die working table, and the deformation has the same amount of deformation generated in the actual work. Therefore, to realize the compensation of the relative deformation of the ram to the worktable, the pressure distribution between the dies is more uniform and the bending quality of the sheet material is improved. 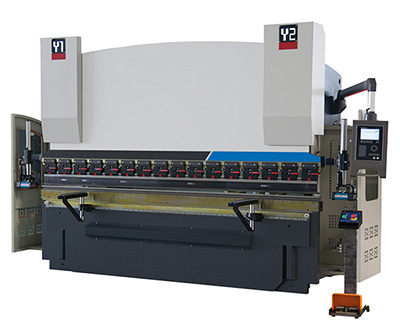 Generally, the press brake manufacturer will not adopt this type of crowning method. Working table fixed convex, that is, at the time of manufacture, the worktable was machined into arc shape with a slightly convex in the middle to compensate for the deflection caused by bending. To make the appropriate correction for the upper mold, the middle part of the mold slightly curved, so when the slider occurs upward deflection deformation, the upper die edge basically tends to be straight, therefore it keeps each bending point along the bend line generate the same bending force for the plate. The advantages of the geometrical compensation method are low cost and easy to manufacture, but there are some disadvantages which can only realize the compensation of fixed deformation and small compensation flexibility. 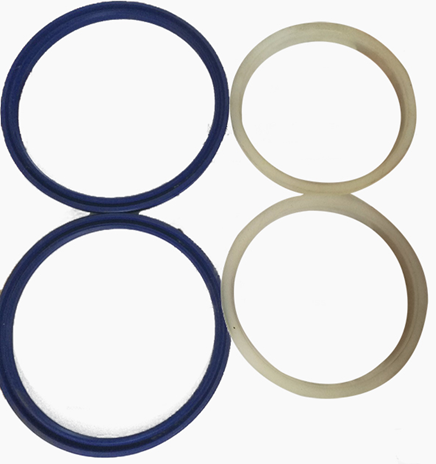 In addition, the compensation block arc correction quantity needs to pass through the precise calculation. The calculation method which based on the mechanics’ theory and the finite element calculation all has the certain error, therefore, even this kind of crowning method can achieve the deflection compensation effect, but it is very difficult to realize. 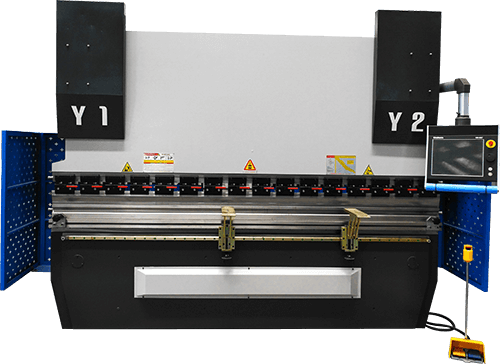 Mainly used on the electro-hydraulic synchronous CNC press brake, because the amount of compensation needs to be controlled by the controller, such as DA52S, DA66T controller etc. 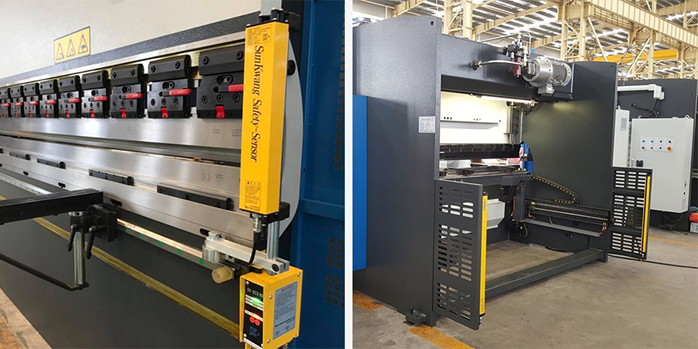 In addition, install two hydraulic cylinders at two sides of the press brake frame and install another two-auxiliary hydraulic cylinder in the middle of the machine. When the ram down, the auxiliary cylinder filled with liquid oil and go downward. During the bending process, hydraulic oil inlet into the auxiliary cylinder, so that the slider generate downward deflection for compensation. Install the auxiliary hydraulic cylinder in the lower part of the worktable. 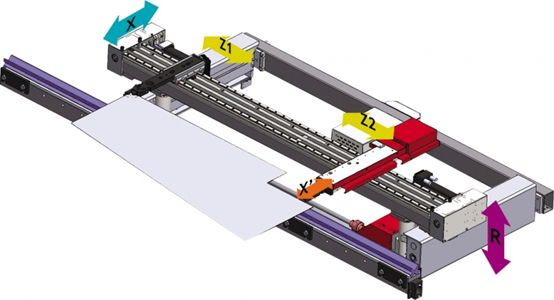 During the bending process, it generates an upward force on the worktable, which forms the automatic crowning system. The pressure compensation device is composed of several small oil cylinders, comprising an oil cylinder, a motherboard, an auxiliary plate and a pin shaft, and a compensating cylinder is placed on the worktable. The pressure compensation system is formed with a proportional relief valve. 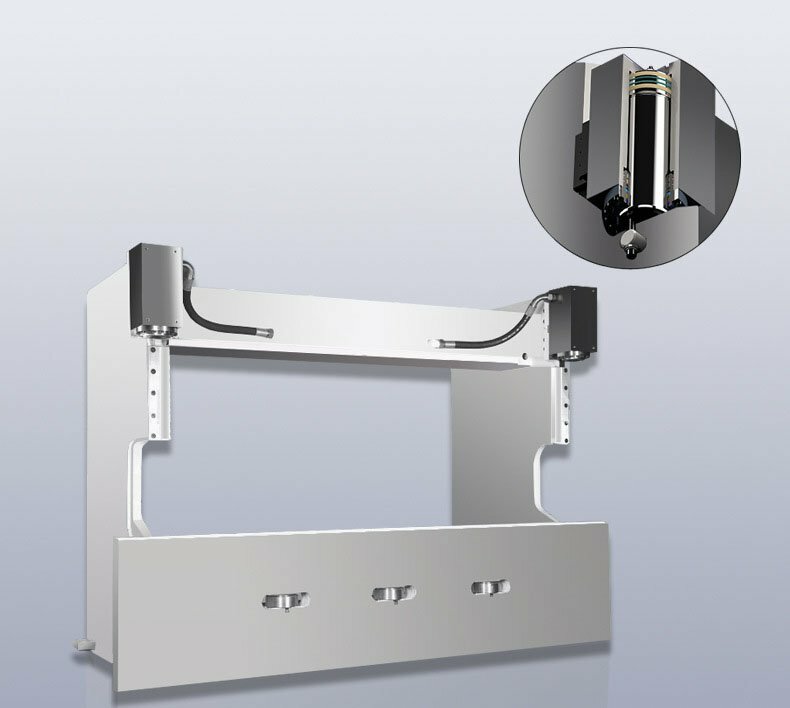 During working, the auxiliary plate supports the oil cylinder, the oil cylinder holds up the motherboard up, just overcomes the deformation of the slider and the worktable. The convex device is controlled by a numerical control system, so that the preload can be determined according to the thickness of the plate, the opening of the die and the tensile strength of the material when bending different sheet materials. 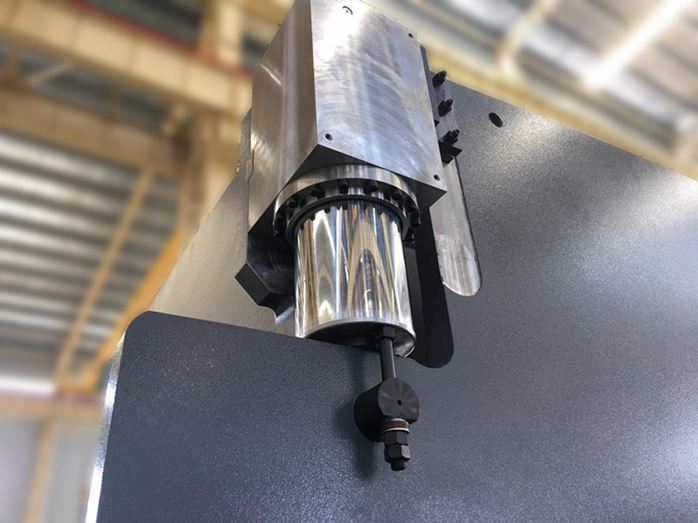 The advantage of hydraulic crowning is that it can realize the deflection compensation for continuous variable deformation with large compensation flexibility, but there are also some disadvantages of complex structure and in relatively high cost. Most widely used crowning method for the ordinary press brake, with good compensation effect and low cost. In real operation, it is very convenient and easy for operators. Mechanical crowning is a kind of new deflection compensation method, which generally uses triangular oblique wedge structure. The principle is that the two-triangle wedge block with α angles, the upper wedge moving is fixed at x-direction and can only move in Y-direction. When the wedge moves the △x distance along the X-direction, the upper wedge moves up the H distance under the lower wedge force. Regarding existing mechanical compensation structure, two bolster plates are placed in full length on the worktable, the upper and lower plates are connected through the disc spring and bolts. The upper and lower plates are consist of a number of oblique wedges with different slopes, through the motor drive to make them relatively moving and forming an ideal curve for a set of convex position.